Peregrine Falcons have successfully settled on the Civic Centre roof in Morden and hatched chicks during this nesting season. A CCTV camera has been installed to monitor the falcons during the fledging period whilst the chick’s wings and feathers develop and become strong enough for flight. 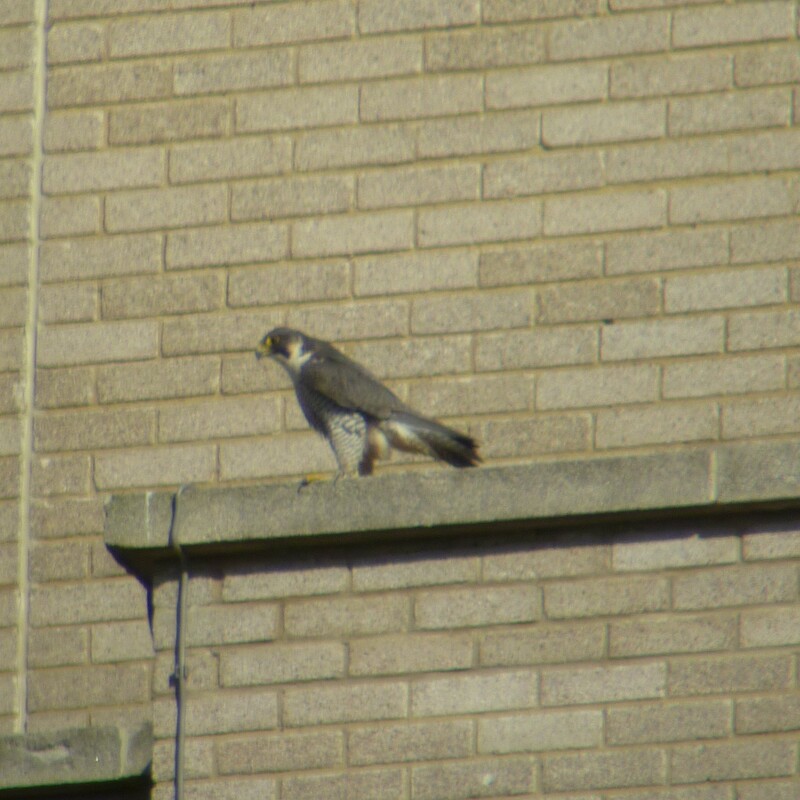 Peregrine Falcon on the Civic Centre, Morden. Peregrines have been victims of illegal persecution and suffered severe population declines in the 1960s and 70s as a result of the accumulated effects of pesticides in their prey. The Peregrine Falcon is legally protected under the Wildlife and Countryside Act 1981. Access to the Civic Centre roof will be restricted during the time that the Falcons are nesting. This is because Peregrines are most threatened when their nesting sites are disturbed. We are working with the London Peregrine Partnership, Natural England and the local Police Wildlife Officers PC 136VW Young and PCSO 7281VW Wood to support the birds without disrupting the management and maintenance of the Civic Centre. The Peregrines 3 chicks could fledge from around 9 June to mid-June. When they are first learning to fly and land, their inexperience can cause them to become stranded on the ground. If a chick is grounded it will be unable to fly, making it extremely vulnerable and likely to die if not rescued. Members of the public who work and/or live near the Civic Centre, are asked to look out for grounded peregrine chicks around this time and if they find one to please contact the London Peregrine Partnership on 07807 738699 or the Merton Wildlife Police Officer on 0208 721 2455. They will safely arrange for the bird to be collected in a secure box and returned to the roof of the Civic Centre. The Peregrine Falcon is the fastest bird in the world and is able to reach speeds of up to 200mph when it swoops in flight.